Kate Wyatt has become renowned for her wildlife paintings which capture the real essence of some of Britain’s most popular mammals. She works primarily in watercolour, layering marks with acrylic ink and pen to bring a structured chaos to her distinctive and inspired wildlife portraits. Her sketches, as well as her finished paintings, combine a skilful mix of precision mark-making with a sprightly looseness, drawing influence from the likes of Gerald Scarfe and Arthur Rackham. Kate has exhibited widely in London, and has work displayed in prestigious galleries in Bristol and across the West Country. Her paintings are held in private collections in the UK as well as the United States, Canada and Australia. 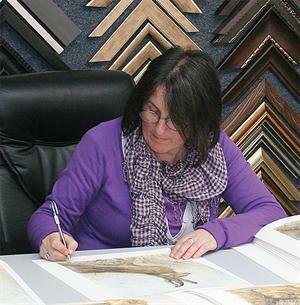 Kate has established herself as a gifted wildlife artist and continues to delight with her unique interpretations of nature.